For our inspiration over at Splitcoast today – Sundance. A fabulous store full of gorgeous clothing, accessories and home goods. I chose this t-shirt for my inspiration. The various images were stamped and overstamped in Basic Gray and Going Gray, then the paper run dry embossed. 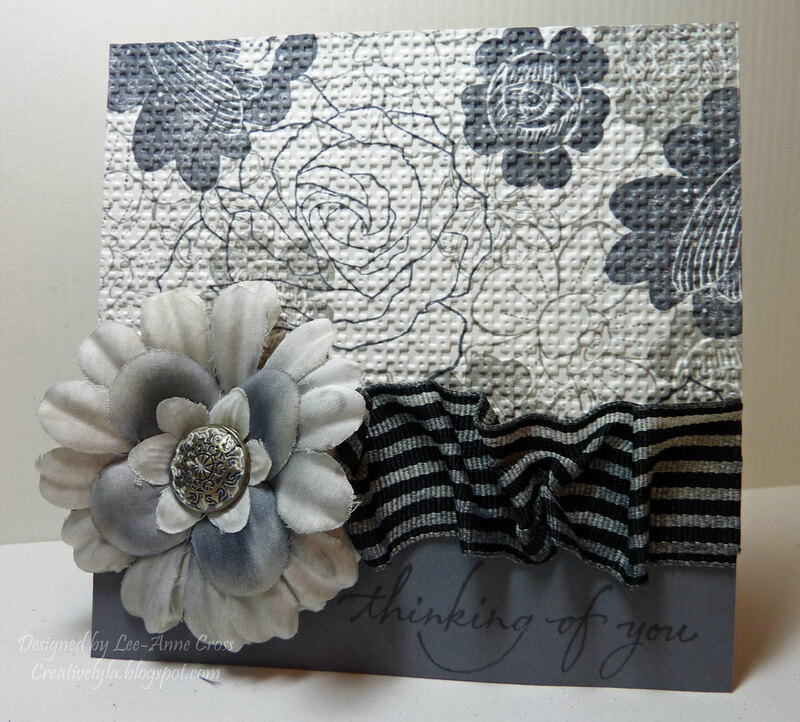 The striped ribbon was inked with Going Gray to darken it. Then I placed a strip of Scor-Tape along the width of the card and scrunched the ribbon across it. The flowers were inked in the same two gray inks as well as a little Sahara Sand. Then I used my black Copic to darken the brad. A simple sentiment was stamped along the bottom of the card. this is gorgeous, I had to come and comment…I adore the texture and flowers….hope your weekend is fabby!